“Croatia, the War, and the Future” Turns 2 Today – Thank You World! Congratulations to Ina Vukic on her achievement! 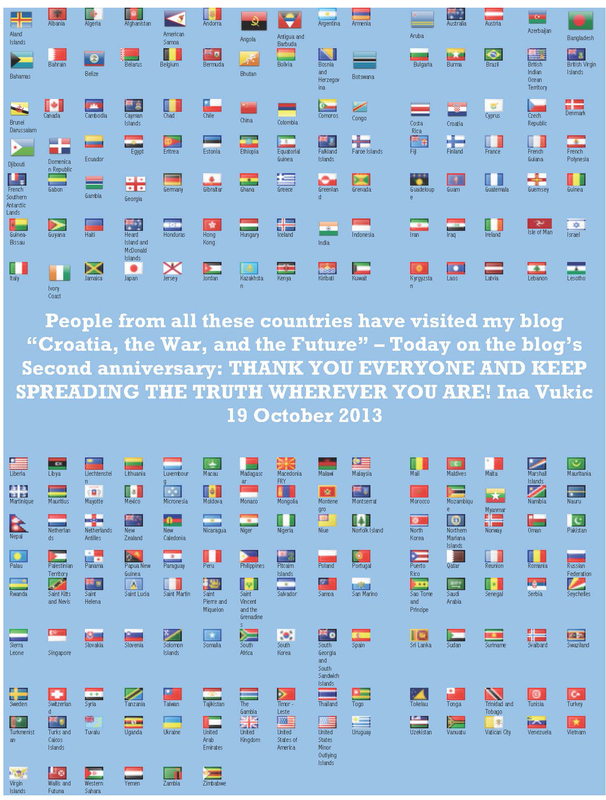 Today is a special day for “Croatia, the War, and the Future” blog- it turns two and celebrates another year of life. Exactly two years ago today, I started this blog with a post “Lest We Forget” on Vukovar, Croatia. Today, two years later, I am still delivering posts on Vukovar from time to time. You may well ask: why? Because Vukovar is the symbol of Croatia’s most recent profound suffering and a place that simply must remain a special place of piety that allows us to remember and heal. Never in my wildest dreams did I think that an independent blog could reach and touch so many people around the world – hundreds of thousands of visits from around the world tell me that while the mainstream media may reap the greatest of numbers, bloggers are catching up very fast.